This is a beautiful 5 acre tract in the country. It is on the corner of Paint Rock Road and Arnold Road. City water is available. 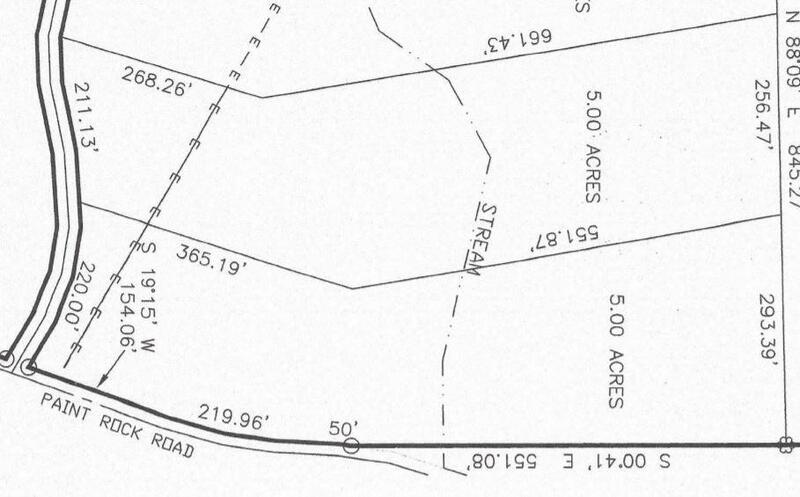 It has 220 feet of road frontage on Arnold Road and 771 feet of road frontage on Paint Rock Road. 959 feet total on the right side. There is a small creek that runs through the property. It is flat pasture in the front and slightly sloping and wooded in the back of the property. Owner financing is available with $1000 down. There are four 5 acre tracts for sale. 110 Arnold is the corner lot, Lot 2 is 118 Arnold, Lot 3 is 124 Arnold and Lot 4 is 130 Arnold Rd. Seller is relative of listing agent. Listing courtesy of Nu Vision Realty.